ThermoWorks designed the fast (2-3 secs to read), most robust, waterproof, ergonomically simple, and painfully accurate (±0.7°F (±0.4°C)) digital thermometers. It is probably one of the most imitated temperature measurement products on the market. 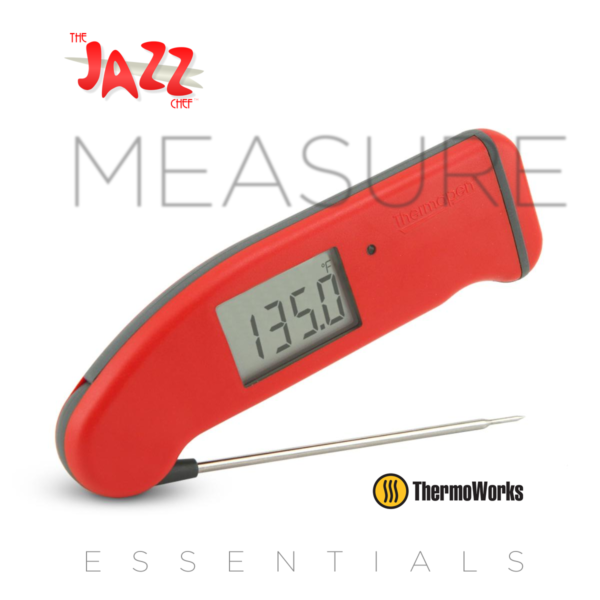 If information is the doorway to culinary perfection, then the Thermapen Mk4 is your key. There is one piece of equipment that I will bug you endlessly to make a part of your Essentials list. You must get one of these. Why? Information is everything in cooking. Knowing when to do something, or stop doing something, is as important, if not more important, than knowing the how or the how much. ThermoWorks designed the fast (2-3 secs to read), most robust, waterproof, ergonomically simple, and painfully accurate (±0.7°F (±0.4°C)) digital thermometers. 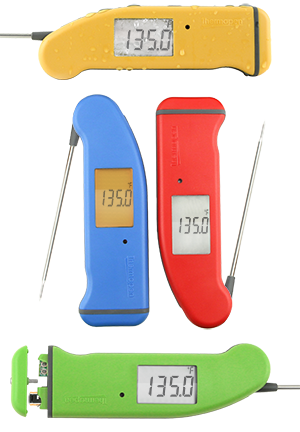 So much so that the Thermapen is probably one of the most imitated temperature measurement products on the market. 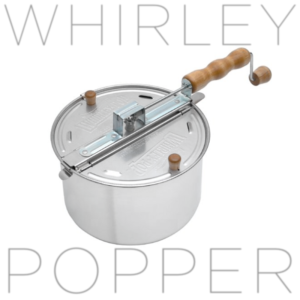 Easy to use, you simply pull on the metal probe and rotate it outwards. The digital gear activates, and gives you a current air temp reading. Meter what you will, no matter whether it is coffee or cupcakes or the cast iron pan surface. The Thermapen does all of it with ease. The new innovation on the Mk 4 is that you can hold it in any direction. and the display will automatically rotate right-side-up so you can read it in any position, from either hand, without cocking your head. A small thing, but handy when you’re measuring a roast in a hot oven or you’re trying to avoid being scalded by steam from a boiling pot. It measures ambient air temperatures well, which is great for everything from proofing dough accurately to showing your service person why the oven’s thermostat needs recalibration, or to correct for the inaccuracy of the device’s temperature settings if your oven or range is a bit off and getting your landlord to fix it, or your budget to deal with replacing poor equipment, isn’t in the cards. Best of all Thermapens allow for a quick flip between Fahrenheit and Celsius. While 95% of the world cooks metrically, Americans do not, but we should, because life in the kitchen becomes so much simpler when you’re not constantly converting inconsistent measures and temperatures. I will make you metric converts, American home chefs! Word. 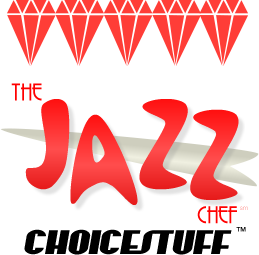 Which is why the Thermapen is at the top of my list for Jazz Chef Essentials, and also picks up a Jazz Chef Choicestuff Five Diamond award. Get 10% off your order! Buy Now. None of our endorsements are made because we are compensated. For more on how we arrive at our ranking system, click here.